Cuban dish of ropa vieja (shredded flank steak in a tomato sauce base), black beans, yellow rice, plantains and fried yuca with beer. Ropa vieja (Spanish pronunciation: [ˈro.pa ˈβje.xa]; "old clothes") is one of the national dishes of Cuba, but is also popular in other areas or parts of the Caribbean such as Puerto Rico and Panama, as well as in Spain and the Philippines. It consists of shredded or pulled stewed beef with vegetables. 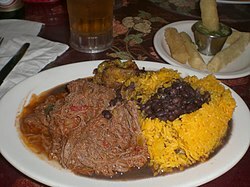 In the Cuban cuisine of Miami, Florida, it is typical for Ropa Vieja to have a sweet undertone. While this is traditionally intended to be due to the use of fully ripe, red bell peppers, it is not uncommon for recipes to include some quantity of sugar as a means to achieve the correct level of sweetness in the finished dish. The Canary Islands in Spain have a version of the dish, where instead of rice on the side they put potato in the pot to cook with the beef and vegetables. It is a very traditional dish for the islands that many restaurants offer on the menu. The most common preparation in mainland Spain involves shedding the leftover meat from a famous soup, cocido, and then pan frying it with paprika and chickpeas. This Spanish cuisine–related article is a stub. You can help Wikipedia by expanding it.